RTC arthropathy = RTC insufficiency, glenohumeral degenerative changes, superior migration of the humeral head. (Jensen KL, JBJS 1999;81A:1312). Massive RTC tear and erosive arthritis of the shoulder. Humeral head migrates superiorly to abut and erode the undersurface of the acromion. Etiology: unknown, may be calcium phosphate induced. Likely multifactorial related to: coracoacromial arch anatomy, tendon tensile overload, repetitive use, tendon vascularity, age-related degeneration. Increasing pain, loss of motion and limitations in activity. Night pain. C/O audible and palpable crepitation in shoulder. May have recurrent sterile effusions (geyser sign) . Decreased active and passive ROM. AP, scapular lateral and axillary views. Evaluate for glenoid wear, superior displacement of humeral head, humeral head erosion, acromial erosion. 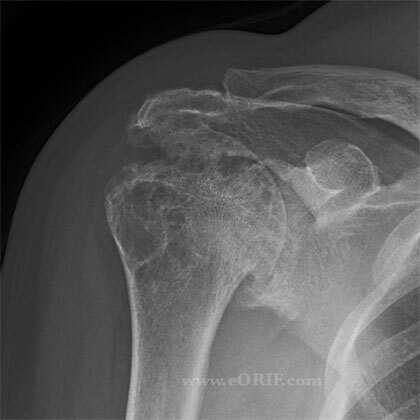 Osteophytes/ joint space narrowing, acetabularization of the acromion. Measure acromiohumeral interval on Grashe view. CT: indicated to evaluate for glenoid bone stock, glenoid orientation and degree of fatty infiltration of RTC. Must have at least 25mm of bone from the glenoid face to the most medial cortex of the scapula to provide seating of the glenoid implant for reverse TSA. (Frankle m, JBJS 2005;87A:1697). Goutallier Classification of Muscle Atrophy (Goutallier D, CORR 1994;304:78). -Stage 1=muscle contains some fatty streaks. -Stage 2=fatty infiltration is important, but there is still more muscle than fat. -Stage 3=there is as much fat as muscle. -Stage 4=more fat than muscle is present. -Degeneration is grade at the tip of the coracoid process and at the inferior margin of the glenoid and the values are averaged to determine the stage. Classification of Arthritis in chronic rotator cuff tears (Hamada K, CORR 1990;254:92). Stage 1: Acromiohumeral interval greater than 6 mm. Stage 2: Acromiohumeral interval less than 7 mm. Stage 3: Acromiohumeral interval less than 7 mm with acetabulization of acromion. Stage 4a: Acromiohumeral interval less than 7 mm with glenohumeral arthritis without acetabulization. Stage 4b: Acromiohumeral interval less than 7 mm with acetabulization and glenohumeral arthritis. Stage 5: Acromiohumeral interval less than 7 mm with osteonecrosis of humeral head. Age <70, active elevation >90°, intact coracoacromial arch, intact deltoid: treatment = Hemiarthroplasty (Sanchez-Sotelo J, JBJS 2001;83A:1814). Active ROM started at 8 weeks. Hemiarthroplasty outcomes: 67% successful, decreased pain, increase in active elevation from 72° preop to 91° post-op. (Sanchez-Sotelo J, JBJS 2001;83A:1814). 68% good/excellent outcomes, 27% satisified, 5% dissatisfied as rated by patients. FE increase from 55° to 105; Abduction from 41° to 102°, ER from 12° to 41°; 17% complication rate, 12% required revision; Encore prosthesis . (Frankle M, JBJS 2005;87A:1697).